The day started with rolling hills on pavement out of town. On the downhills, I noticed I was much slower than my two partners. It must be because my front end is very wide and flat – not very aerodynamic. 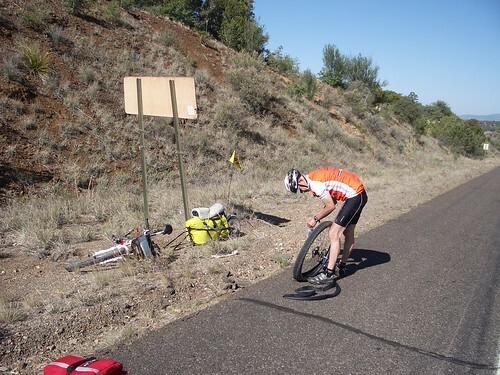 On our climb to the Santa Rita pit mine, Mathieu’s tire was punctured. It took some time to replace the tube and reattach his BOB trailer. I didn’t complain, though, since I enjoyed the short rest. We turned off the paved road and did a number of miles on a rocky road. I tired quickly of the short/steep climbs. 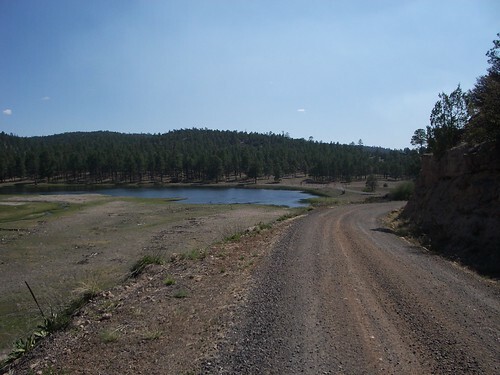 Eventually they yielded a rocky downhill section that spilled back onto pavement near the town of Mimbres. We rode off route a few miles to a restaurant to have our last proper meal. 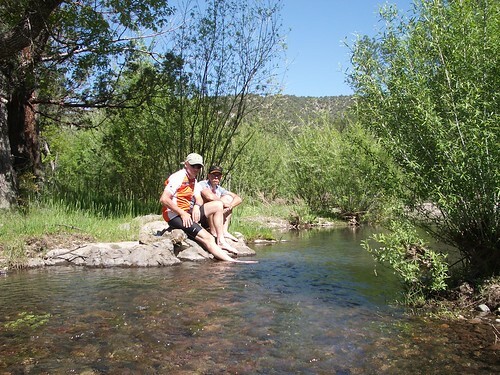 After lunch, we headed north into the Gila wilderness. There were prescribed burns along the road, which made for some very smokey sections. Much of the rest of the day was spent climbing steep and rocky switchbacks. This was my first time cycling in the mountains…and I dove in head first with a bike carrying 50+ pounds of equipment, food, and water. I have not mastered the slow and steady climb, and found myself pushing the bike up the steep sections. Even in the granny gear, my legs were doing very low RPMs, I was mashing the pedals as hard as I could, and I was only managing 4 mph. Any slower and I’d lose my balance and be forced to put a foot down. 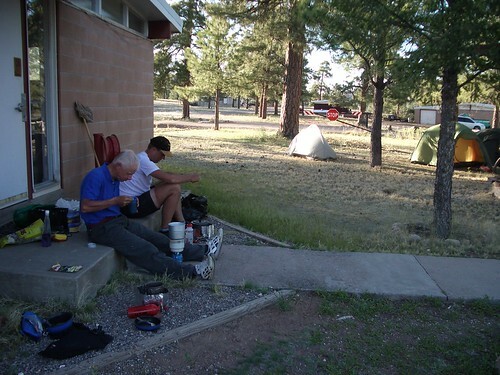 Around 18:00, after many hours of struggling, we made it to the Rocky Canyon campground. We set up our tents and cooked our meals. Auke had a lot of trouble getting his stove to light. The fuel bottle was too full and the stove was upside down! We joked that Auke is a rookie camper and I am a rookie cyclist. We went to bed early, or I should say we tried to. I was kept awake by our noisy campsite neighbors. It was a group of families with dogs, kids, and Jeeps. Day one in the mountains, and I struggled terribly. What have I gotten myself into? The day started with an extremely hard climb – it wasn’t the last either. We topped out and rode mostly on flats for a while then descended into Black Canyon. Running through the middle of it was a very nice stream. We stopped for food and filtered some water. Fresh mountain water tastes great compared to tap or bottled water. It was also so cold that it numbed our feet when we dipped our tired legs in. The climb out of the canyon was absolute hell. It consisted of many miles of steep roads covered in loose gravel. It had me pushing my bike in no time. Even that was difficult. Each time I stepped, my feet slipped backward. When I finally reached the top, I found Mathieu and Auke waiting. They had been there for 20 minutes already! Five minutes later, we were riding again. We descended into a valley by the Geronimo Trail and rode through a small creek. The climb out of the valley was a tough one. As I walked a section of it, a group of people in pickups and ATVs drove up to me. It turns out that when this group passed Mathieu, he told them I needed a Coke. They gave me not one, but two ice cold Cokes! I told them about our journey and they seemed quite impressed. When they left, I pressed (walked) onward. Mathieu had had enough with the climb as well and was also walking. We finished the climb together on two feet. We had a long and gradual descent to Wall Lake. While there, we rested in the shade of a large tree and looked over the water. The group that had given me the Cokes came back and stope to talk to us again. They gave each of us sodas to drink! We were their entertainment, and they paid in drinks. We stayed there longer than we planned – cold drinks and a great view kept us. When we did leave, we had another 8 miles of moderate climbing to our day’s destination. This time, I was determined not to walk. I pedaled and pedaled, keeping my head down looking only a few feet ahead of me. After a few false summits, I finally reached the top. 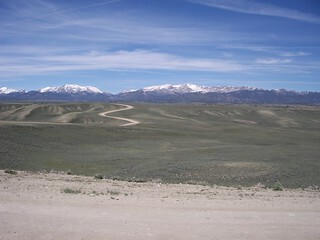 The day’s ride ended with a gradual downhill to the Beaverhead Work Center. There was a coke machine, water pump, and an outhouse. What more could we ask for? This entry was posted in Journal on June 7, 2010 by dave. It was good to talk to you today. You sound like you’re in good spirits. It seems like you’ve made it over the hump (literally)! You’ve found your pace and fallen into your routine. It sounds like your really getting stronger too. Most importantly, it sounds like you’re stilling enjoying yourself and having fun! We’re proud of you! Hey! We figured out how to do this! Read the last few days and it sounds like you’re having fun? Glad to hear you are healthy and getting some junk food once in a while. I’m sure mom will have brownies for you when you get home with pizza at D’s. We miss that. Have been following on the tracker. Amazing that the lady knew about you guys before you got there (Pie City). Try and stay upright! Embarassing in a parking lot!